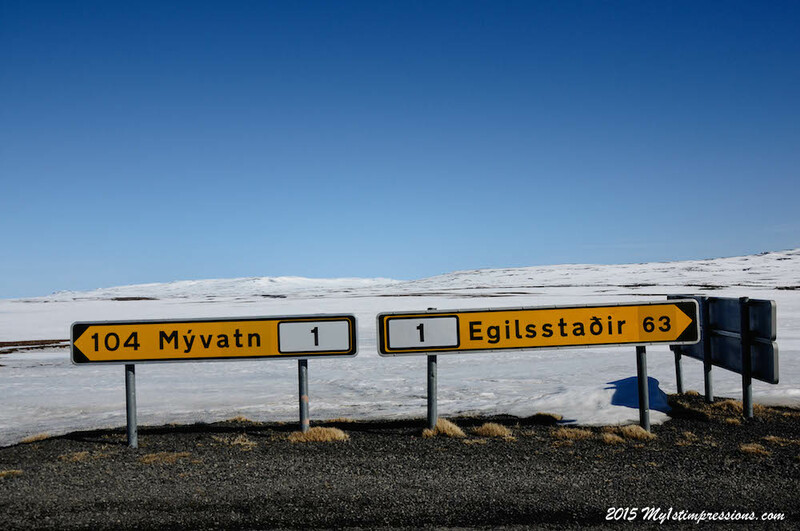 That part of Iceland that goes from Seydisfjordur, in the far East, to Akureyri, in North Iceland, is certainly one of the most breathtaking scenery you can visit not only in Iceland, but in the world. Leaving Seydisfjordur on Route 93, connecting the tiny village to Egilstadir, the biggest town in the area, is a pelasure for your eyes. The road goes upper and upper on the mountains surrounding the the towns before descending the valley again, discosing stunning view of the mountains around, enlighted by the rived in the valley behind Egilstadir that will take your breath away. Take your time to stop along the way. 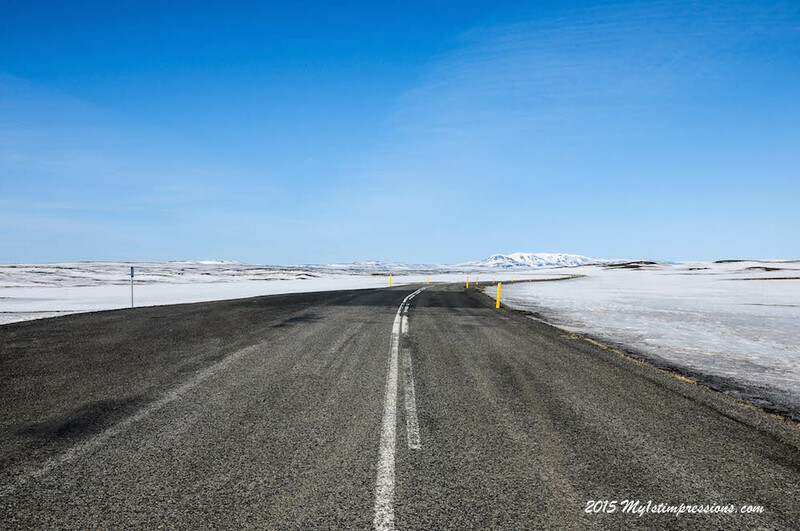 There are almost no cars on the road and with the long days of middle April, there is plenty of time to enjoy your Iceland time. 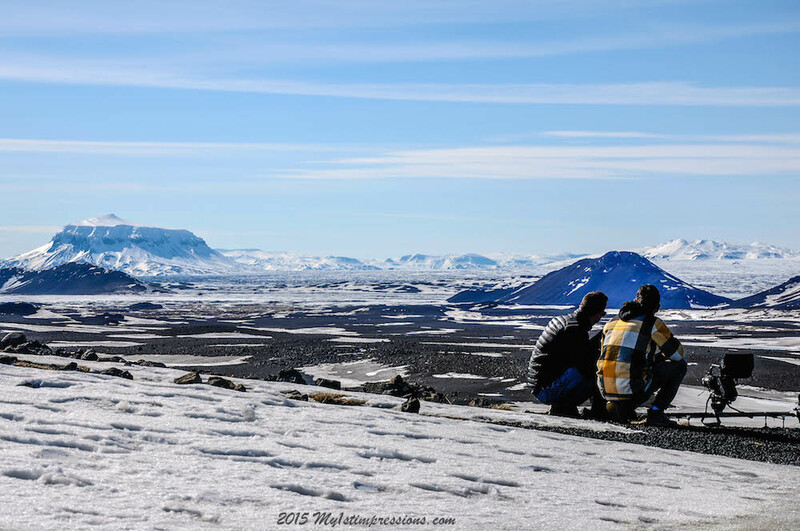 And even if you think the landscape cannot get better than that, Iceland never stops surprising you and just few kilometers ahead it prepares for new surprised made perfect and precious by a stunning blue sky that made the landscape around majestic. You won’t find a lot of other cars along the road that goes from Seydisfjordur to Akureiry. And this is the best part of this corner of Iceland. People seems to be scary and usually skip this part of the world, so it is a pleasure to drive alone surrounded by a landscape that often remembers the moon, with its wonderful contrasts in colors where the blue of the sky shine on the white of the snow peaks and the black of the lava fields around. When on the top of a mountain we start to see the profile of the volcano Askja, I am not exaggerating if I say we were all left without words to comment such beauty. Majestic, solitary and imponent, Asja dominates the landscape and the horizon of that part of Iceland all the way to Myvant. You can see it from everywhere, impossible to avoid it, impossible not to fall in love with its beauty, not to feel its presence around. 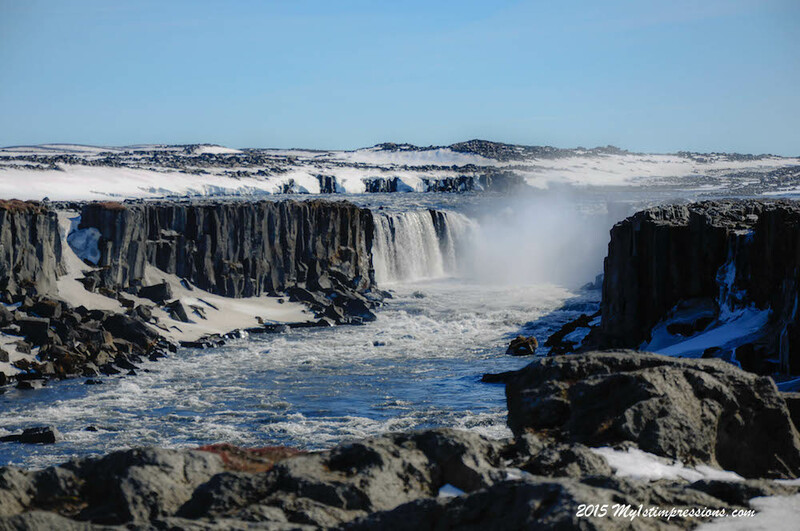 But the real vision of the day if few kilometers forward, when we take the road that goes to Dettifoss, the biggest waterfall in Europe and I believe the most beautiful of all. 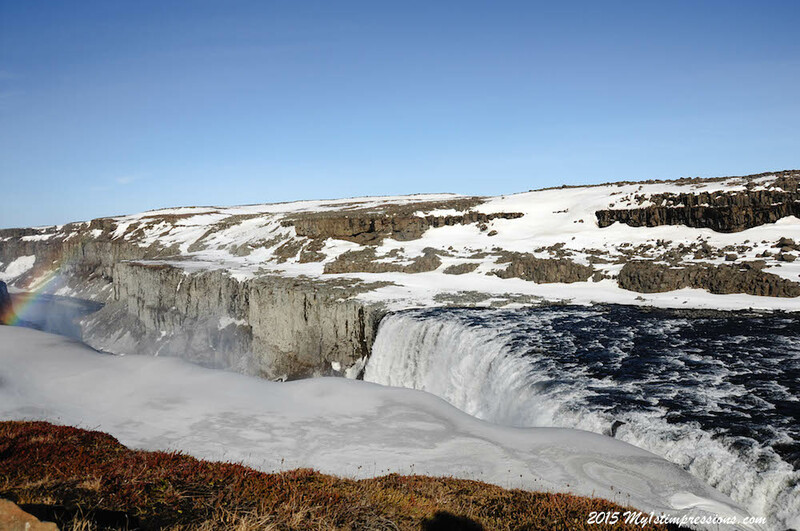 Dettifoss is not as clearly visible as the other waterfalls in Iceland. It hides itself behind some step rocks and some snowy fields that make the research of it a bit tricky but also excited. A smaller waterfall on the right gives a glimpse of curiosity about the bigger one, but you are definitely not prepared to such a massive power force of Mother Nature when you see it for the first time. 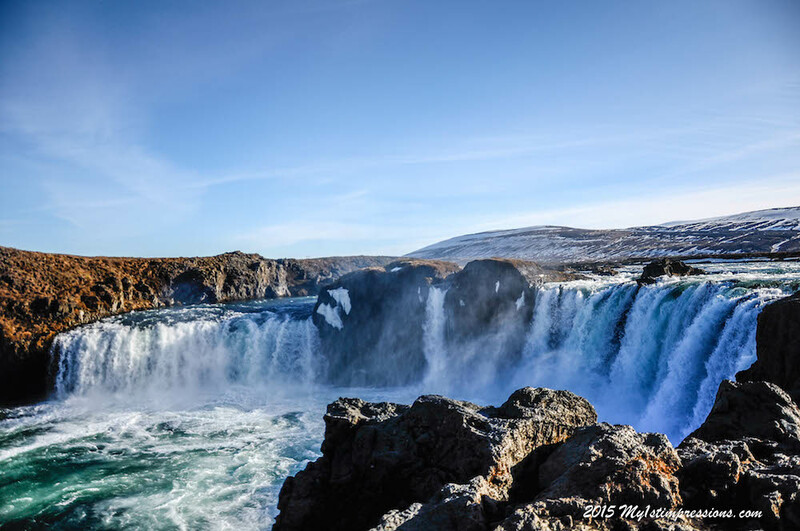 It is not a surprise if it is considered the msot powerful waterfall of Europe and when you stand on the cliff right next to it you realize you are in front of one of the msot impressive expressions of Iceland’s beauty. Just a simple look at this waterfall could be enough to fall in love with Iceland forever. There is everything in this place to explain the reason why everyone fall in love with this country: the wilderness, the Nature’s perfection, the feeling of being so small and so lucky to experience that, the majesty of the place, the loneliness of the site and, last but not least, even the rainbow that is born by the water. Too beautifula nd perfect to believe it is true. 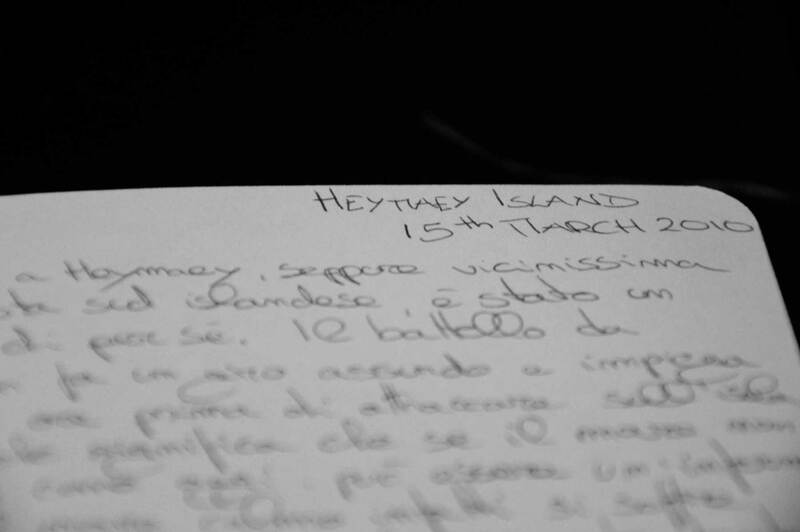 To beautiful and perfect to find a proper way to comment what you are experiencing. The trips goes further towards Myvatn lake, still frozen after such a freezinf winter, and after we pass the lake next stop is Godafoss, probably the msot important waterfall of Iceland, as it is the waterfall where the old imagines of the pagan gods were thrown into the water b y a Norse king the year Iceland decided to become Christian. Perfectly shaped among lava rocks and split in two cascades, Godafoss gets more and more beautiful the more you get closer to it. You can sit on a rock in front of it or stand watching at its neverending flow for hours without getting bored of it for a second. You can come to visit Godafoss as many times as you like and you will always find it charming and beautiful, you will as well always find it different as it changes according to the colours around. 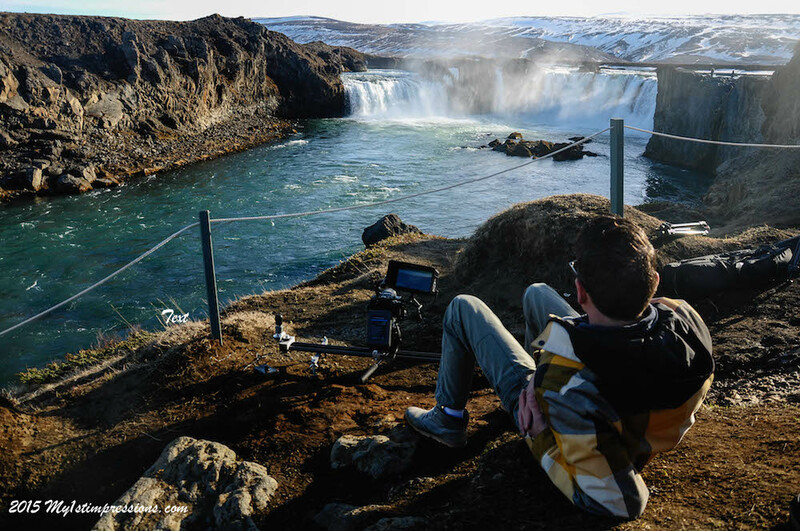 We spent quite a while at Dettifoss and Godafoss with Johannes and Frank from Traveltelly. The sites were wonderful and we couldn’t be more lucky than that with such a shiny and even hot weather. It was great to experience the first sun of the year here in Iceland, the first warm rays of sun again after such a terrible winter. It was a long but very satisfying day for everyone that ended up in Akureiry with a warm meal, a shower and a early sleep, all terribly tired, but terribly happy, too.